You all know how I feel about ice cream and other frozen treats. I think they're the BEST. I eat ice cream and popsicles year-round, with zero qualms about it. I don't care if it's snowing outside in the Winter, I will take a bowl of ice cream, please. Anywho, when brands reach out to me as a blogger, I'm pretty exclusive. Not as a prideful thing, but simply because I don't want this blog to become one big sponsored ad. If I share a product with you, it's because I genuinely think, OH! My readers should know about this. With that said, when Fruttare reached out to me to promote their dessert bars and fruit bars, well...I think you know that I was on board. 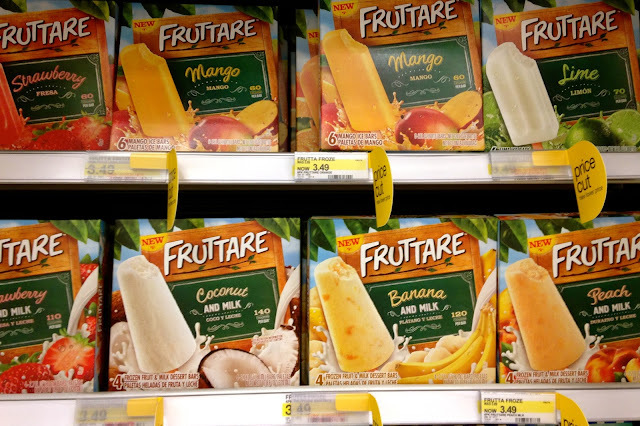 I headed into my local Super Target to the frozen aisle and decided to try the peaches & milk dessert bars and the lime fruit & juice bars. The peaches & milk dessert bars were exactly that - peachy and perfect for dessert. They didn't taste artificial at all, real chunks of peaches and the sweet creamy flavor made it such a treat. It really tasted like homemade ice-cream on a stick. Soft, smooth, sweet, and savory. You can't beat that. Now, let's talk about lime popsicles. They're my favorite BUT the color kiiiinda freaks me out. It's usually like something out of ghostbusters and I'm afraid it's going to turn my insides glow in the dark. I also can't handle how "crunchy" and sometimes gritty frozen popsicles can be. My favorite things about the Fruttarre lime fruit & juice bars were that it had no artificial flavoring and it was the perfect mix of sweet and a bit of tang from the lime. Not to mention, again, it was soft and smooth. 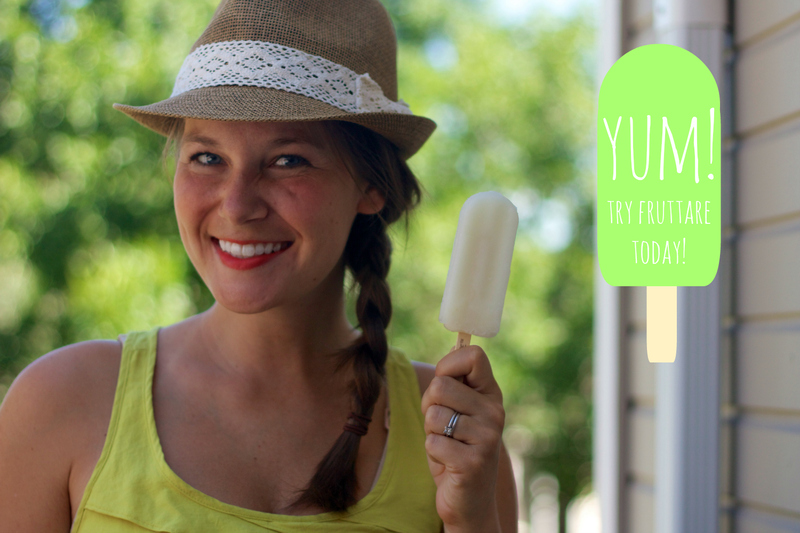 Anything citrus + cold is so refreshing to me, this fruit bar was no exception. Both of these are the perfect treats for when you get back from the pool, back from work, back from a hike, back from the living room, etc. ;) I, for real, can't wait to try more flavors! They're now on my grocery list for the week - I want to try the strawberrrrrrry. I mean, you can never have too many frozen treats waiting for you in your freezer can you? Want to win a box of Fruttare bars? Comment below with what flavor you want to try ((flavors here)) and a winner will be picked next week! I'd love to try the orange flavor. I'm pretty much a sucker for anything orange flavored. Yum! LOVE frozen treats, especially during the summer time in blazing hot Texas! I think the Strawberry and Milk looks divine...nothing beats a sweet that has fruit in it! Coconut and Milk sound tasty. Like horchata on a stick. Mmmmmmm ... they look delicious! I think I would want to try the strawberry and milk! The coconut and the mango and the peach all sound good, too. Ya, pretty much all of them sound good! Strawberry and/or coconut and milk! Yum! They all look good. Would love to try the mango or lime! Mmm, these look so yummy!! I've been eying these in the store and would love to try the strawberry and milk! Peaches and milk - fo' sho!! I can eat one at work when I can't have the peach margarita that I REALLy want! ;-) Thanks for the heads up! I'd be all about the lime, too! Mmmm peaches and milk sounds perfectly refreshing! I think the coconut sounds nice. The lime sounds good as well though! What if you got both and took bites of each. Coconut Lime! The lime one looks delicious!! I've had the strawberry, and it's sooo good! I'd like to try the mango too. I would love to try the strawberry or the mango! These sound & look great! I'd love to try the mango and the strawberry & milk. All of them sound great, though! I LOVE these things! The coconut and milk is my absolute favorite but the banana and milk is up there on the list, too. So excited to see them featured on your blog. Lime is my favorite Popsicle flavor but I've never tried this brand. Crossing my fingers for some limey goodness! You had me at lime! That said, I would LOVE to try their coconut + milk flavor. This girl over here loves anything coconut! Ooh I enjoy those flavors, like mango and coconut! It's so good to have a frozen dessert with natural flavors unlike the popsicles of childhood. Are they only at Target? This girl wants to try these out! Next pool party dessert, anyone? Now I really want to try these! I think the one I'd want to try the most is Lime. I LOVE Lime popsicles. My favorite. Next time I see them, I'm going to pick up a box. I can see a new obsession in my future. Nothing better than a cool banana and milk treat! I would love to try it! i can't decide between the peaches & milk and the strawberries & milk...but they all sound yummy!!! I want to try the coconut and milk first. But most of them look really good.